1. Preheat the oven to 400 degrees Fahrenheit and line a baking sheet with parchment paper or a silpat. 2. In a large bowl, mix the chickpeas, sesame seeds, sunflower seeds, pumpkin seeds, 3 tablespoons melted coconut oil, cumin, garlic powder, coriander, pepper, paprika, turmeric and cayenne pepper. Spread out on the baking sheet and cook for 30-40 minutes, stirring every 10 minutes. 3. Place the cashews (or sesame seeds for a nut free version) and garlic in a food processor and pulse until minced. Add the remaining dressing ingredients and blend until smooth. The dressing will be much thicker than regular salad dressing. 4. In a large bowl, massage the dressing into the kale. 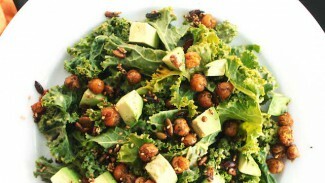 Top with the avocado and sprinkle with the crispy chickpea and seed mixture.